It was another spectacular weekend in the Bundesliga, with at least three goals in all but one game on Matchday 8. Four teams managed to keep a clean sheet, and there was only a solitary draw between FC Ingolstadt 04 and Borussia Dortmund. With some excellent performances and goals galore, there was plenty for Official Fantasy Bundesliga managers to get excited about this weekend. 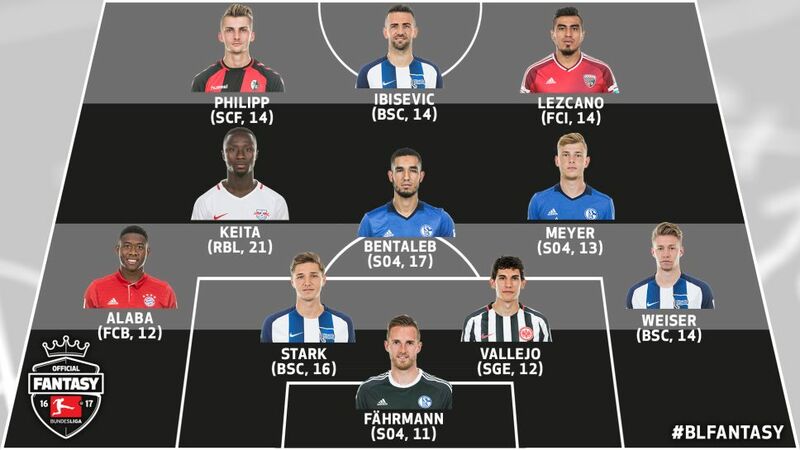 Check out which players made the difference in our #BLFantasy Team of the Week for Matchday 8. Ralf Fährmann (FC Schalke 04, 11 points) – The Schalke keeper had an important role to play in his side's 3-0 win over 1. FSV Mainz 05. The 05ers had almost as many attempts on goal (10) as the Royal Blues (11), but Fährmann kept them at bay throughout, earning his second clean sheet of the season. Niklas Stark and Mitchell Weiser (Hertha Berlin, 16 and 14 points respectively) – Stark scored his third header from a set-piece in the Bundesliga to hand Hertha victory over fellow high-fliers 1. FC Köln, while Weiser provided the assist for Vedad Ibisevic's opener. Weiser also led the Old Lady in touches (65), runs (79) and sprints (31). David Alaba (FC Bayern München, 12 points) – Alaba was a constant menace down the left flank against Borussia Mönchengladbach, setting up Douglas Costa's goal as the champions beat the Foals for the first time since January 2014. The Austrian international had the most runs (84), sprints (37) and crosses (4), as well as 96 touches of the ball. Jesus Vallejo (Eintracht Frankfurt, 12 points) – The 19-year-old centre-back – on loan from Real Madrid CF – belied his tender age with an assured performance at the heart of the Frankfurt defence, as they kept a clean sheet in the 3-0 win over Hamburger SV. He won 12 tackles as the Eagles limited their hosts to just three attempts on goal at the Volksparkstadion. Naby Keita (RB Leipzig, 21 points) – The Guinean international had the biggest points haul of the weekend after inspiring Leipzig to victory over SV Werder Bremen. The 21-year-old not only scored a brace, he also ran the show in midfield, with the most touches (124) and tackles won (21) of any player on the pitch. Nabil Bentaleb and Max Meyer (both FC Schalke 04, 17 points and 13 points respectively) – Bentaleb became the first Algerian to score a Bundesliga double as Schalke continued their resurgence with a 3-0 dismissal of Mainz. Meyer also got involved with his first league goal since March, as the duo netted three times from their four attempts on goal. Watch: Bentaleb praises the Schalke fans after his match-winning performance against Mainz. Maximilian Philipp (SC Freiburg, 14 points) – The 22-year-old German was the hero for Freiburg in their 2-1 win over FC Augsburg, opening the scoring on 66 minutes before turning provider for Nils Petersen. Philipp is the first Freiburg player since Papiss Cisse in 2011 to have notched four Bundesliga goals after eight match days. Vedad Ibisevic (Hertha Berlin, 14 points) – Another week and another goal for Ibisevic, who gave Hertha a 1-0 lead for the fourth time this season in their win over Köln. The Bosnian is up to six for the season and 98 in the Bundesliga overall, which puts him level with Korean legend Bum-Kun Cha in joint-sixth on the all-time list of foreign goalscorers. Dario Lezcano (FC Ingolstadt 04, 14 points) – In spite of Lezcano's best efforts, Ingolstadt narrowly missed out on a shock home win over Borussia Dortmund, as Christian Pulisic rescued a 3-3 draw. The Paraguayan international had the most sprints of any player on the pitch (35), and scored twice from his three attempts on goal. Watch: Lezcano's thoughts on his side's thrilling draw with Dortmund.